Hi, I'm a long time lurker here. How hard would it be to have a separate draw distance for actors? A few weeks ago I was experimenting with extended cell load distance and using the small feature culling to reduce the rendering load. In addition to the frozen cliff racers, the small feature culling also resulted in a lot of headless actors, which was by far the most objectionable artifact I was noticing. Having separate "draw distance" and/or "small feature culling" parameters for actors versus other objects would allow for more flexibility in tuning the performance at extended draw distances, particularly before a more advanced form of distant statics gets implemented. I'd prefer the second one. Or to disable actors culling completely. In my testing "small feature culling pixel size = 8.0" was enough to notice "headless" NPCs. But anyway with culling small objects appearing/disappearing instantly during player movement, what quite odd. Can we try to "fade" objects (e.g. by adding transparency for objects with cullingThreshold + delta size)? About "frozen" cliffracers: I wonder how MGE handles this case. IIRC, it did not render actor if distance to player > AI/animation distance. Near that borders actors were partially transparent. Maybe if we manage to implement it, we will get an additional performance boost. Probably we need an ability to disable whole objects on particular distance to implement such sliders. 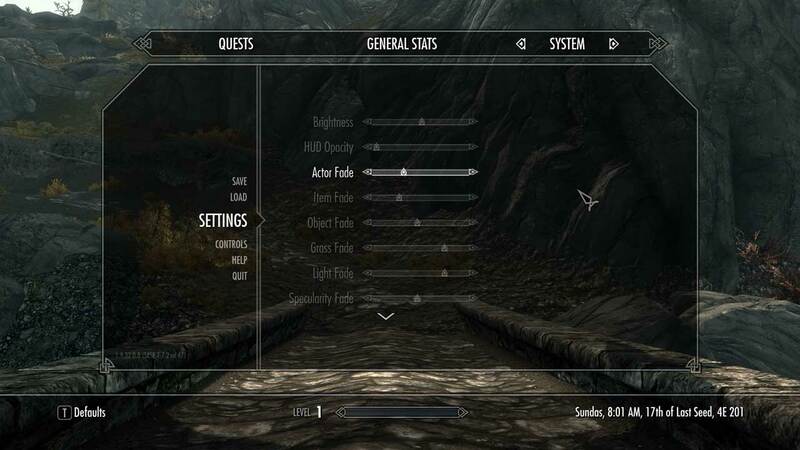 Sliders for all the categories that Skyrim has would be great, but for now, I think that just having separate settings for actors versus statics would go a long way. Since there's already a way to disable actors in reflections, my guess is that this would be low-hanging fruit. If we allow distant actors, but not other distant statics, would that mean that people behind walls etc would be visible from a distance before you get close enough for the walls to populate? Or am I misunderstanding the nature of the feature? No, I'm saying it would be the other way around - distant statics but not distant actors.